Spotify and Hulu have partnered to offer a combined streaming media service that could save your money to access your favorite streaming music and videos. So here we will mainly talk about things you need to know about Spotify and Hulu bundle. Part2: How to Download Spotify Music without Spotify Premium? Part3: How to Get Movies and TV Shows from Hulu? Spotify is a digital music, podcast, and music video streaming service which gives users access to millions of songs and other content from artists arround the world. Users can play music totally free, but users can also choose to upgrade to Spotify Premium ($9.99 per month) for playing music without ads, listening to music offline, and streaming high audio quality. Hulu is the best video streaming service with Live-TV, but now only available in the United States and Japan. The service provides the excellent catalog of complete TV seasons, huge library of original series. anime series and Live TV with cloud DVR. It is the top option for those who want to legally stream new and classic TV programs across a wide variety of platforms. (1) $7.99 per month to get get unlimited access to the Hulu streaming library with limited or no ads and enjoy full seasons of exclusive series, hit movies, Hulu Originals, kids shows, and more, but $11.99 per month to avoid advertising for the on-demand library on its own. (2) $39.99 package that includes both live TV and the on-demand library with limited ads. Spotify and Hulu have expanded partnership to give music and video fans all of their favorites in one Premium bundle for $12.99 per month, and $4.99 per month for students. This subscription plan brings the two popular streaming services together and allows its subscribers to enjoy ads-free music on Spotify Premium, as well as huge library of TV shows and movies on Hulu’s $7.99 limited ads plan. To bundle Spotify and Hulu, you will need to sign up with Spotify Premium account, and the billing fees will be charged from your Spotify account. Step 1 Go to Spotify and Hulu page and click on GET STARTED. Step 2 Log in your Spotify Premium account if you have. And you can sign up for Spotify if you do not have account. Step 3 Select GO TO HULU and you will get a link under your account overview to active Hulu. Once you select this link, you allow Hulu to access your Spotify account and Hulu will send you a email with an activation code. Step 4 Log in your Hulu account to enter this unique activation code, and if you do not have Hulu account, you can sign up an account to enter this code. Once log in your Hulu account on Spotify, your billing information will be transferred to Spotify. The person who has an existing Spotify Premium or a Spotify Premium for Students subscription can get Spotify Premium with Hulu, but now, this bundle is only available for new or current Hulu subscribers who are billed by Hulu. Once you get Spotify Premium with Hulu, you are not allowed to sign up or access any Hulu Premium Network Add-ons, Hulu + Live TV, or the Hulu (No Ads) plan. Part 2: How to Download Spotify Music without Spotify Premium? With Spotify free account, you can listen to any song on Spotify but with many limited features like shuffle play and ads-supported. If you want to skip the ads during the listening, play any song you like, and download entire album, artist, or playlist on your mobile devices for offline listening, you will need to upgrade to Spotify Premium, $9.99 per month subscription service for enjoying music without any limitation and streaming 320kbps high audio quality. Have you ever wonder how to download music from Spotify with free account? 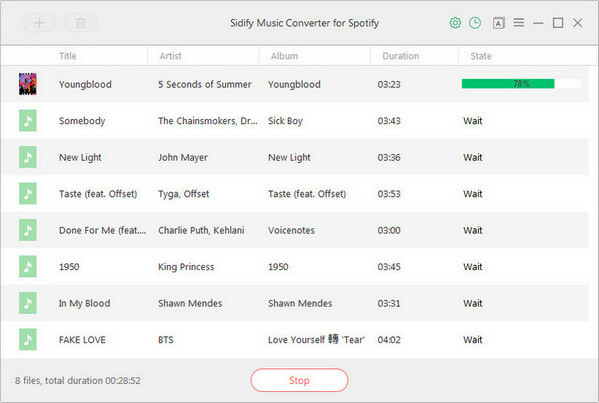 If you are looking for a solution, today we recommend Sidify Music Converter for Spotify (for Windows | for Mac), which is a powerful Spotify music downloader to help you download any tracks, playlist, artist or album from Spotify to plain formats like , with which you can losslessly download Spotify playlists to audio formats including MP3, AAC, FLAC and WAV with Spotify Free or Premium account. Download Spotify song or playlist to MP3/AAC/WAV/FLAC. Keep 100% original audio quality of Spotify after conversion. Keep all ID3 tags and metadata to well organize music library. Burn Spotify music to CD and share Spotify music via Email. Fast conversion speed & highly compatibility. 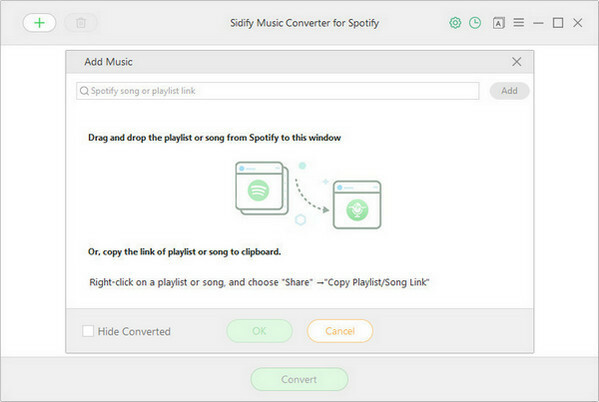 Run Sidify Music Converter for Spotify after successfully installation. Please note that you will need to install Spotify app on your computer in advance. Click on icon on the top left corner of Sidify main interface, if prompted, you can copy Spotify song or playlist link to the clipboard, or drag & drop a song or whole playlist to the adding window. Click on button to customize the output settings: Output Format, Output Quality, Output Path and Conversion Mode. 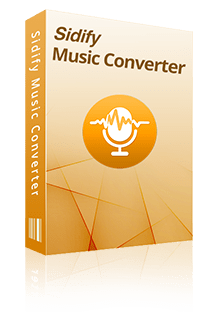 Here you can choose the output format as MP3, AAC, FLAC or WAV, output quality as High (320) kbps, Medium (265) kbps, and Low (128) kbps. 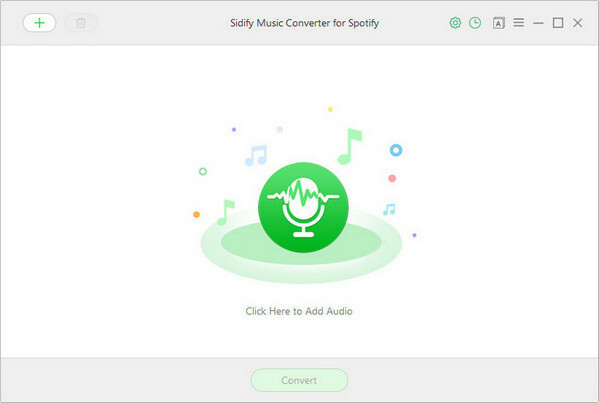 And you can choose conversion mode as Spotify Record to output the 100% original sound quality of Spotify. 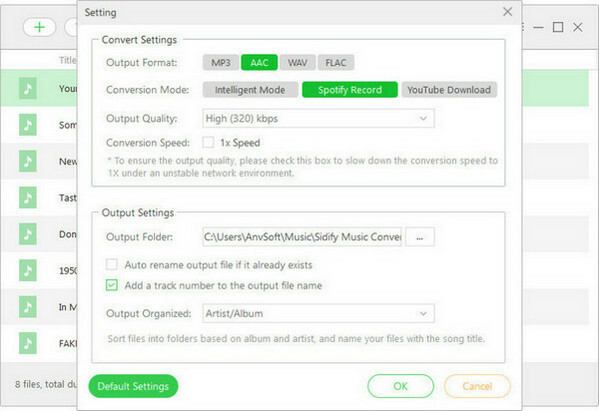 Click on Convert button to start downloading music from Spotify. After the downloading completed, you can click icon to find the well downloaded Spotify music. Part 3: How to Get Movies and TV Shows from Hulu? Hulu is one of the largest website in which you can watch TV shows and movies online, but frustratingly, most of the content can not be downloaded even with the third part tools. So how to get the movies nd TV shows from Hulu for offline watching? Here Any Video Converter Ultimate is an easy solution to help you capture streaming videos from Hulu, Metacafe, NetFlix, Amazon, and etc. How to Record Hulu Videos? Step 1 Download and install Any Video Converter Ultimate, then launch this streaming video recorder. Step 2 Click on Video Record button to start recording online videos from Hulu or anything elase on your screen. Step 3 Select the recording area. You can play the video you want to record, and the program will automatically detect the recording area and mark it with red rectangle. Or you can manually select the recording area. Step 4 Click REC to start recording the Hulu video screen. And you can click Ctrl + F7 to stop the recording. 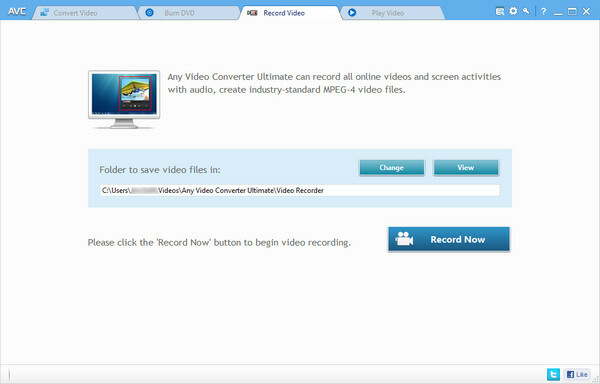 After the recording process completed, the recorded video will be shown on the main window of Any Video Converter Ultimate. And you can right-click the recorded video and select "Open Source File Location" to find the video from local drive. Now you have 2 extra methods to help you get the better experience when using Spotify and Hulu. Just have a try if you need.